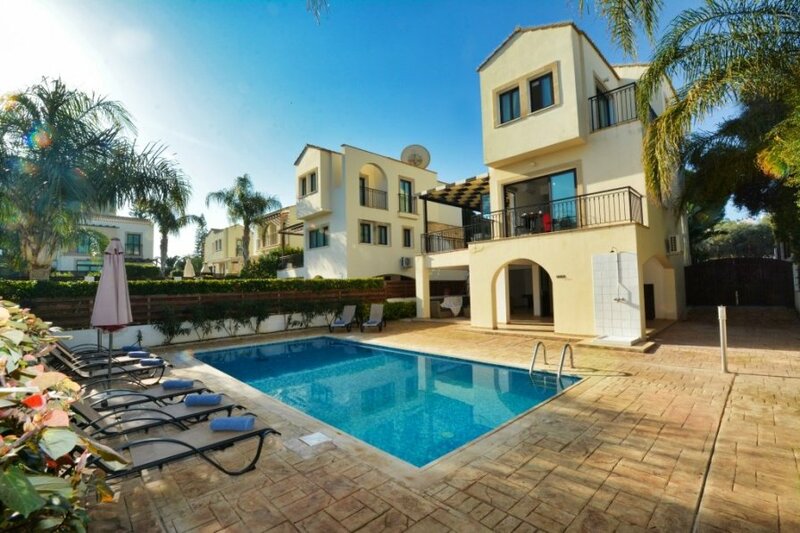 This lovely 4 bedroom villa with private pool is located in central Protaras, just 5 minutes walk from all amenities of the resort centre and the fabulous beaches. The villa is set out on three levels. The ground floor features an open plan dining and kitchen area with seating for 6 persons and a fitted kitchen with everything provided for a comfortable stay. Patio doors lead onto a large veranda which is ideal for outside dining and has views down towards the sea. The living room is situated at the back of the property, overlooking the pool area and features a comfortable sitting area with satellite TV and DVD player. There is also a WC on this floor. Upstairs, the villa has 3 bedrooms, one double room and 2 twin rooms all with fitted wardrobes and bedside tables. There is also a family bathroom with bath and overhead shower. Downstairs, the lower ground floor features a double bedroom and a shower room. This floor also gives access to the garden and pool area which is spacious and sunny with plenty of room for sunbathing and relaxing. A covered area features a pool table and there is also a shaded sitting area which is perfect for enjoying the warm summer evenings. The villa is perfect for a relaxing family holiday and an excellent choice for those who want to be close to all that Protaras has to offer.